Paleo Cornbread Muffins. While these cornbread muffins don’t actually contain any corn, they are still very tasty. 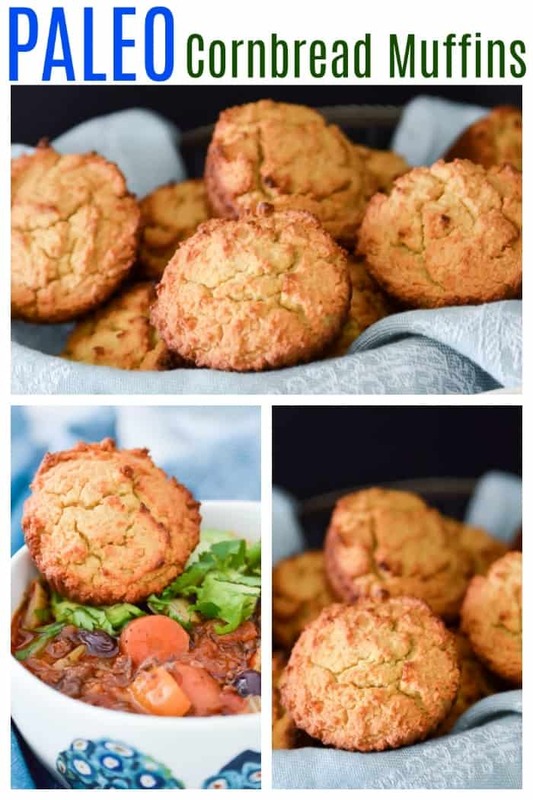 These grain free cornbread muffins are the perfect pairing to your favourite chili or stew. They also make the perfect breakfast or snack. Paleo Cornbread Muffins are what we are eating this week friends. Now, the name is a little bit of a misnomer because there is definitely no corn in these muffins. There are no grains at all to be exact. Since grains are so hard on the gut, and since most chronic health conditions, especially autoimmune conditions, stem from dysfunction in the gut, avoiding those ingredients that irritate the gut is crucial to help your body heal. But I personally used to love cornbread muffins so I was determined to come up with a recipe that was similar to my old favourite. I am pretty darn happy with how these Paleo Cornbread Muffins turned out. They make the perfect pairing to the Whole30 Slow Cooker Chili with Blueberries that I posted last week. Chili and cornbread, it doesn’t get much better than that if you ask me. Now if you are on my Pure and Simple Nourishment Newsletter List you would have already received this recipe last week. I often send out recipes to my subscribers before they are published on the blog so if that interests you please subscribe. For those of you following my C.diff adventure, I stopped my third round of antibiotics on Friday. So I am now in the watch and wait period. Every other time I have stopped the antibiotics the C.diff flared within 24-72 hours, so please send me a little prayer that this final round of antibiotics actually did the trick. My bowels aren’t back to normal yet but they are definitely doing better than they were a week ago. I am also taking a ton of supplements to help me heal. Supplements like probiotics (I am using this brand), L-glutamine, zinc, DGL and saccharomyces (this is a type of yeast that is helpful for antibiotic induced diarrhea – you can get it here). Oh yes and collagen peptides! How could I forget my favourite supplement? Sheesh (Get my favourite collagen peptides here). I am planning on doing a full post about my C.diff story as well as the things I am using to help heal my gut, but many of you have been asking for an update so I wanted to answer all the questions I’ve been getting before that full post goes live (I also need to make sure I have killed this beast once and for all before I write it). When I changed to the paleo diet I thought my days of delicious cornbread were over. But I have been experimenting more and more with paleo baking lately, and I became determined to make a recipe that resembled one of my old favourites. Because while I do think avoiding grains is necessary to help heal from many chronic health conditions (you can read Why Grains Are Not Healthy here) I also firmly believe that you should still be able to eat your favourite foods while doing so. Foods like chili and cornbread. When it comes to comfort food, there is almost nothing better if you ask me. Especially when winter just never seems to end! 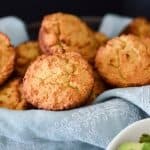 Besides being a great addition to chili, these Paleo Cornbread Muffins also go really well with stews and soups and even make a great breakfast or snack. Plus they are pretty darn easy to make which I know many of you appreciate. What else would you pair these muffins with? I would love to hear your thoughts!